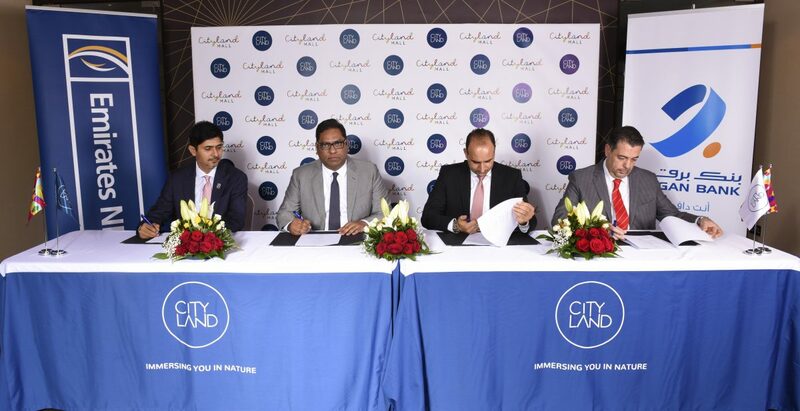 Cityland Group today announced a major financing milestone for the USD 330 Million flagship retail project – Cityland Mall – from a consortium of banks consisting of Emirates NBD as the lead bank and Burgan Bank from Kuwait. The loan, which totals USD 142.74 million in value, will be utilized for covering the ongoing project cost in terms of construction for Cityland Mall which will be the only major destination mall opening in 2018 in Dubai. In terms of leasing arrangements, agreements are already in place with operators for 30 per cent of the leasable space available. Cityland Mall will eventually have 350 stores built around six continent-themed pavilions. Hypermarket and supermarket chain Carrefour, operated by Majid Al Futtaim will open a 100,000 square foot hypermarket in Cityland Mall while VOX Cinemas will also have a presence with a 10-screen complex providing a choice selection of F&B options and signature concepts. Construction work on the 2.2 million square feet mall complex is well under way and is being supervised by JLL as the project manager. MEP (Mechanical, Engineering and Plumbing) works are now in progress for all areas. The focus has been on the critical areas of the project that will house the hypermarket, family entertainment areas and the foundations for the main feature of the mall, the circular timber arched walkway that surrounds the Central Park. Cityland Mall which is the world’s first ‘nature-inspired’ shopping destination will feature a 200,000-sq-ft open-air garden called Central Park which will be the epicenter of the mall in terms of both architecture and its anchoring role in providing a unique sensory experience for shoppers. Cityland Mall will also be a prime attraction for various communities in Dubailand area such as Arabian Ranches, Marjan, Al Barari, Layan, and Falcon City amongst many others who live along the Sheikh Mohammed bin Zayed Road corridor and end up travelling up to 30 minutes to access a superior mall experience.